Keep both the line and ground side leads as short and straight as possible. (It is the sum of the two lead lengths that must be used in the calculations). The lead from the line should go to the arrester FIRST -- then to the termination. The ground resistance should be as low as practical. This means ten ohms if the cable has an insulating jacket or is in a conduit. The issue of lead length on the voltage that will be impressed on a cable has been discussed earlier in this chapter. All of that is correct. There is, however, one more issue here. Does that lead cany the lightning current? If the lightning current flows in that lead, its length is a factor. If, on the other hand, the lead does not carry lightning current its length and impedance are not factors. In the real world, the current generally flows through all the paths that are available. The amount of current times the length of each lead establishes the voltage that is impressed on the cable. The practical point is that the circuit must be analyzed in its entirety. 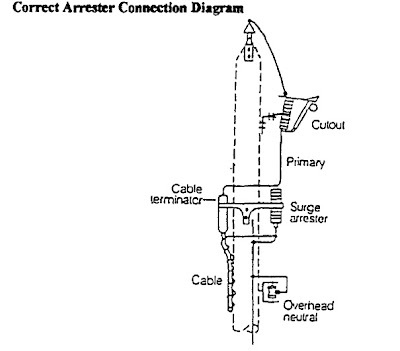 In the beginning of this section, it was stated that the lead from the incoming line should first be attached to the arrester -- then to the termination. Wait a minute. This isn’t the way we have always done it! Are you certain of that? Yes. If we can visualize the flow of lightning current as a flood of water, we can easily recognize that we would be much better off if we could divert that flood around our house - not through it. That is why the arrester is the first connection point. The bulk of the current flows through the arrester and through its ground. The termination lead length is not very significant because it isn’t carrying that much current. Why is the ground resistance / impedance important? We are concerned about voltage and voltage is the product of current and impedance (length). Almost all of the current that goes through the arrester must flow to ground at the arrester location. Remember that the impedance of an overhead line (the neutral for our purposes) is about 50 to 60 ohms. If the ground at the arrester is very high, then all of that lightning current must flow along those neutrals. That means that the “footing” resistance is 60 ohms. The voltage that is developed is the current multiplied by 60 ohms. Even if there are two directions for the ground current to flow, this can be a very high voltage. The voltage build-up through the arrester is increased by the voltage build-up in the ground circuit.